Laura was thrilled to be a guest lecturer for DePaul Sociology Professor Anthony Ippolito’s class: Plants, Chicago and the Rest of Society. The class was reading one of her favorite books, Michael Pollan’s The Botany of Desire, and for the chapter on Tulips, she provided a Landscape Architect’s perspective on how plants and flowers are used as part of the LA’s toolbox. 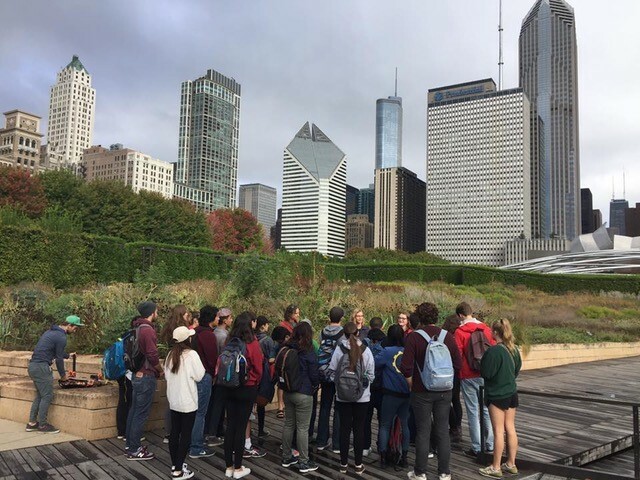 Laura was fascinated by the rhetorical question presented in Pollan’s book, “Did I choose the plants or did the plants choose me?” So she led the class on a tour of Lurie Garden and explained how flowers and the Lurie Garden “seduced” her into becoming a landscape architect. She described the magic behind a few of Illinois’ most unique native plants and encouraged the students to see flowers and plants in a new way. The Lurie was in full fall flower and was populated with many visitors including insect pollinators and birds. The class was engaged and full of fantastic questions.